Chris Russell and his daughter Gabby are the chairmen of United Way's campaign. 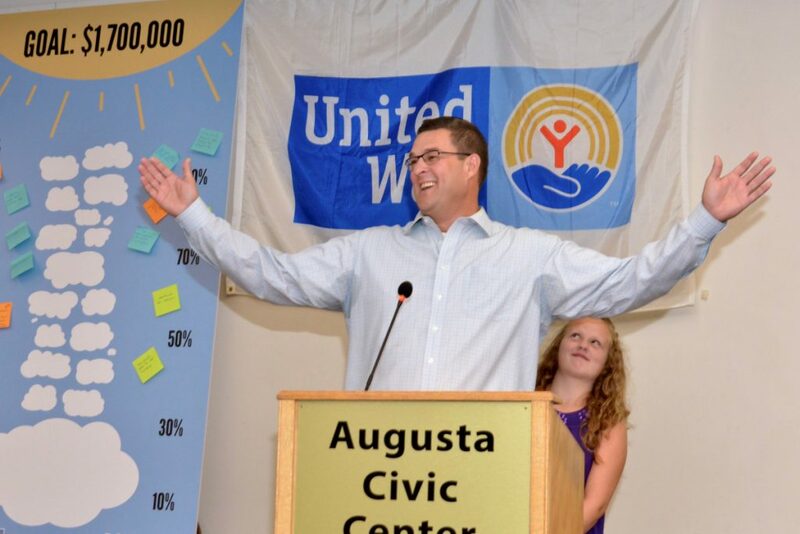 AUGUSTA — United Way of Kennebec Valley launched its 2018 fundraising season with $1.1 million in committed support, the most ever pledged this early in the campaign. Twenty-six businesses reported their advance campaign success to a crowd of more than 320 people at the Campaign Kickoff on Wednesday. Chris Russell and his 8-year-old daughter Gabby, of Farmingdale, are co-chairing United Way’s annual appeal effort. They announced a goal of raising $1.7 million by December. Chris, project manager/supervisor at G&E Roofing and longtime United Way board member, and Gabby, a third grader at Hall-Dale Elementary School, are charged with mobilizing the caring power of those who live and work in Kennebec Valley. Early progress indicates that United Way has raised 69 percent of its overall goal to date. This year’s campaign theme encourages donors to make a gift that will “Power the Dream” for a stronger, healthier Kennebec Valley by supporting 48 nonprofit programs. Rob Gordon, executive director of UWKV, presented United Way’s Community Builder Award to John and Lisa Rosmarin as well as John Fallona. These individuals were celebrated for their consistent leadership-level contributions and the spirit of generosity they have fostered in the Greater Augusta community. During the event, Linda Wilcox, a tutor with Literacy Volunteers of Greater Augusta, also shared her role in helping an immigrant mother obtain her medical coding certification. Literacy Volunteers receive significant funding from United Way to help adult learners improve reading, writing and related literacy skills so that individuals may reach their full potential. Members of UWKV’s Emerging Leaders Society joined co-chair Gabby in hosting a kickoff school supply collection, with attendees contributing dozens of backpacks and more than 100 bags of items. Recipients of these supplies included the Children’s Center, Southern Kennebec Child Development Corporation, Literacy Volunteers, the Boys and Girls Clubs of Kennebec Valley, and local schools. To support United Way’s community-wide campaign, or for more information, call 626-3400 or visit uwkv.org/give.